G Patrick Omameh vs. DI Cameron Heyward – After receiving a grade over 80 for his performance in Week 4, Omameh’s overall grade of 72.8 now ranks 23rd among guards. More impressively, his pass-blocking grade of 83.4 is ninth at the position. Allowing just two total pressures on 134 pass-blocking snaps, Omameh’s pass-blocking efficiency of 98.9 ranks fourth at the position. Against the run, Omameh has struggled with a 45.2 run-blocking grade ranking 41st among guards. With a run-defense grade of 83.3, Heyward has the ability to capitalize on the aspect of the game where Omameh struggles. Through four weeks, Heyward’s run stop-percentage of 10.8 ranks sixth among 3-4 defensive ends. 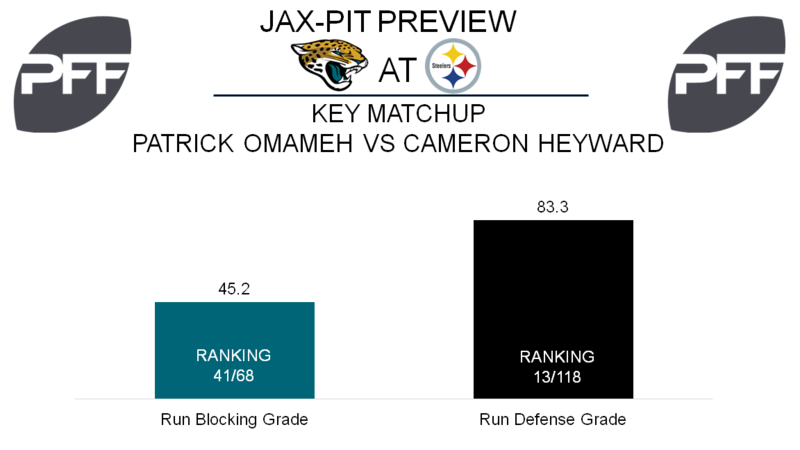 As the Jaguars look to establish the run and keep the potent Steelers attack off the field, Heyward getting the best of Omameh could cause a drastic change in the game script. WR Marqise Lee vs. CB Artie Burns – Coming off a week four performance he’d like to forget that included a crucial late drop, Lee is hoping he can bounce back. After a big step forward in 2016, Lee’s overall grade of 48.4 ranks 84th among wide receivers and to this point his passer rating when targeted of 38.6 ranks 86th among 92 qualifying receivers. With an overall grade of 82.6, Burns, in his second season, is quietly coming into his own. Burns ranks eighth among corners, allowing just 0.39 yards per coverage snap through four weeks. It will be telling when the Jaguars do try to get Lee (who has seen 80+ snaps on both the left and right side) going how often Burns (primarily a right cornernback) is the man in coverage. HB Leonard Fournette vs. LB Ryan Shazier– The Fournette/Shazier matchup isn’t intriguing for the reason you may think. Though his pass-catching ability was a question coming out of LSU, Fournette has managed to haul in 12 of his 15 passing game targets to this point. His receiving grade of 78.8 ranks 13th among qualifying running backs. The biggest test of Fournette’s career as a pass catcher comes this week against Shazier, whose coverage grade of 85.5 ranks fifth among linebackers. Despite the high marks, Shazier has been targeted once every 6.6 coverage snaps and his 106 yards allowed after the catch is the fourth most among inside linebackers. 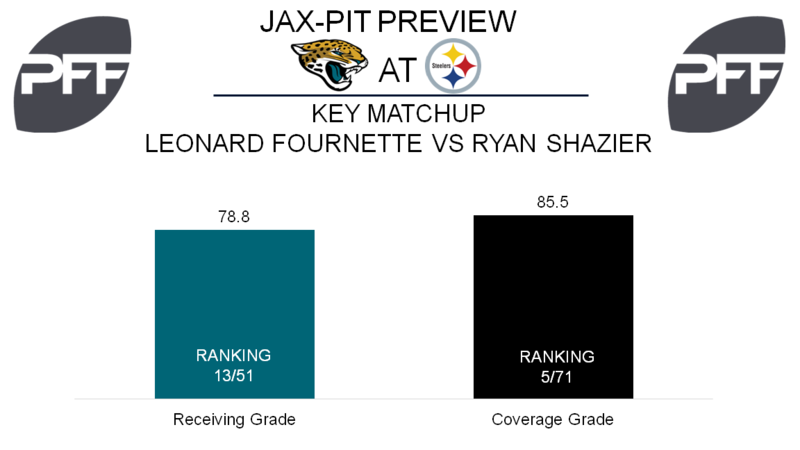 With Fournette’s ability to break tackles, it will be interesting to see how often Blake Bortles looks for this matchup. WR Antonio Brown vs. CB A.J. 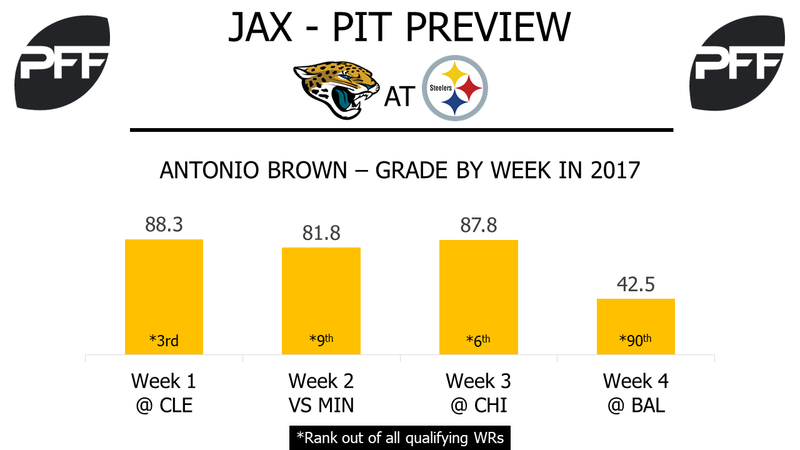 Bouye – Brown will be looking to forget his performance against the Ravens in Week 4, as his 42.5 overall grade was the lowest of his career and ranked 91st among wide receivers. His 90.7 grade dropped to 87.3, still leaving him among the highest graded receivers on the season (currently ranked third). He only had a catch percentage of 57.1 in Week 4 but Brown has not had back to back weeks of under 60 percent catch rate since Week 4-5 in 2015, and Ben Roethlisberger missed both of those games. While Bouye has only allowed a passer rating of 35.2, the sixth-lowest in the league among cornerbacks, his 1.21 yards allowed per coverage snap are the 67th fewest. He is one of only three cornerbacks to allow over one yard per coverage snap while allowing a passer rating below 50.0 this season. G Ramon Foster vs. Edge Calais Campbell – While Foster’s 59.6 overall is the lowest among the Steelers offensive line, he owns the 12th highest pass-blocking grade by a guard this season with an 82.0. Foster has yet to allow a sack in 2017, even as he has dealt with a hand injury that caused him to play only 10 snaps in the Week 3 loss to the Bears. Even though Campbell is an edge defender, he has lined up at right defensive tackle on 39 plays this season, which is second only to outside left end (41). Campbell has recorded five of his seven sacks while at right defensive tackle, leading to a strength versus strength battle when he lines up across Foster. HB Le’Veon Bell vs. LB Myles Jack – Bell could finally find his form against the Ravens, he was the highest graded running back in the league for Week 4 with an 86.5 overall. His 81.1 receiving grade was his highest since Week 14 of 2016, meaning Bell may have finally found his rhythm in the passing game this season. Bell’s 1.56 yards per route run this past week was the first time this season he has broken the one yard per route run threshold. It’ll be tough to follow it up with another similar performance as Bell goes up against Jack, whom has the highest pass-coverage grade by any linebacker this season (92.8).